The Ortelius offers both adventure cruises and scuba diving cruises in Antarctica. 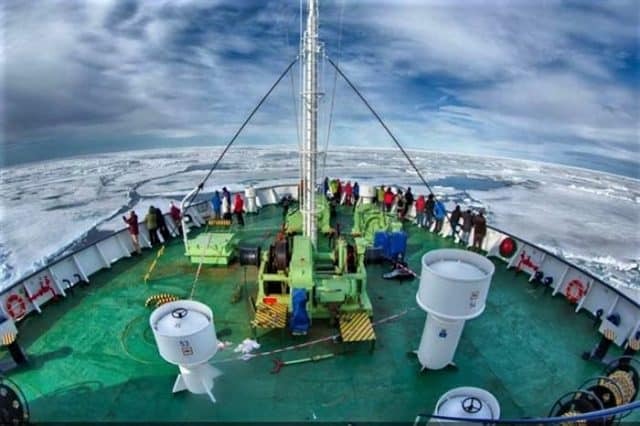 The 91 meters vessel is classified on the highest ice-class level for polar region. Thus, the Ortelius has all it takes for a memorable cruise in a very pristine region of our globe. The ship is part of the Oceanwide Expedition Fleet and has been upgraded between 2012-2017. Plus, the activities are many, and all are free of charges, so you will get to kayak icy waters, do photo workshops, try snowshoe hiking, and much more. The Ortelius counts 53 cabins of various layout, allowing a maximum of 116 passengers aboard. 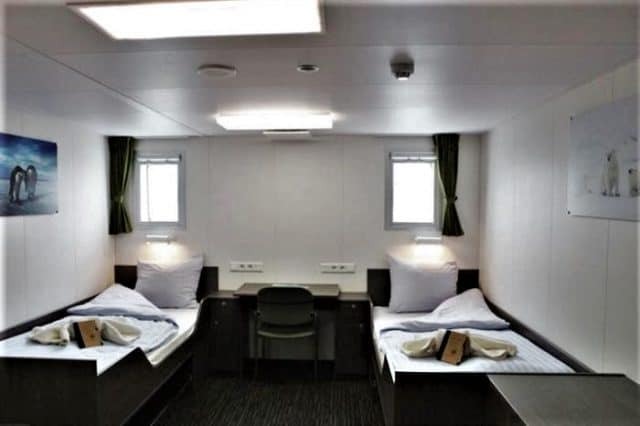 The cabins are located on various decks, and range from superior double cabins to quadruple shared rooms. Basically, every cabin features a private bathroom, ample storage space, a working desk, flat screen television, and much more. Moreover, the deluxe and superior room types also features a coffee corner, mini-fridge and a couch. Visit this page to view prices & schedule for this boat! The Ortelius is like a massive, floating hotel, allowing amazing discoveries in a unique and pristine region of the world. 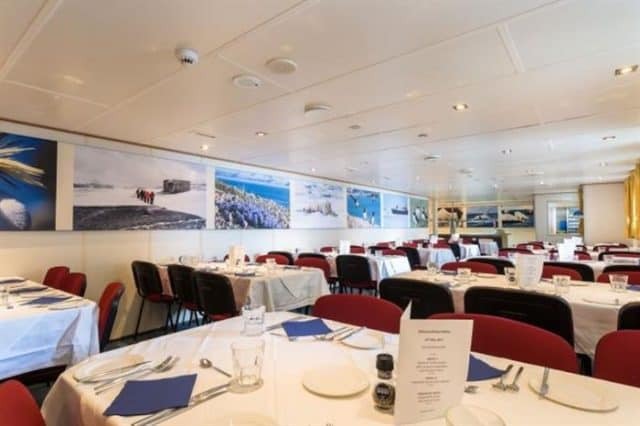 You will find two restaurants on the boat, as well as a spacious lounge area with bar service. The crew on the Ortelius is composed of many more members than the usual liveaboard. Indeed, the remoteness and the complexity of such adventure cruise requires different professionals to work with the passengers. On each cruise, you will have 20 international nautical crew members, 19 hotel crew member, but also 7-8 expedition staff ready to guide you in the wilderness. 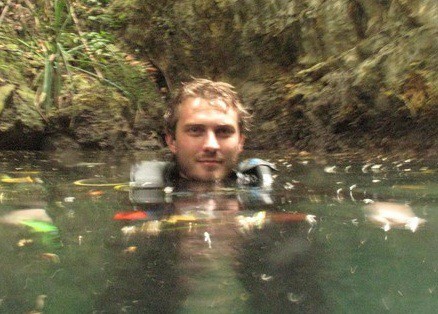 Also, there’s always 1 doctor traveling on-board the adventure and diving cruises. Finally, the massive deck at the bow is perfect to maximize wildlife spotting. Indeed, it’s the perfect view point to observe the unreal, polar landscapes of Antarctica that the Ortelius passes through during an adventure cruise. 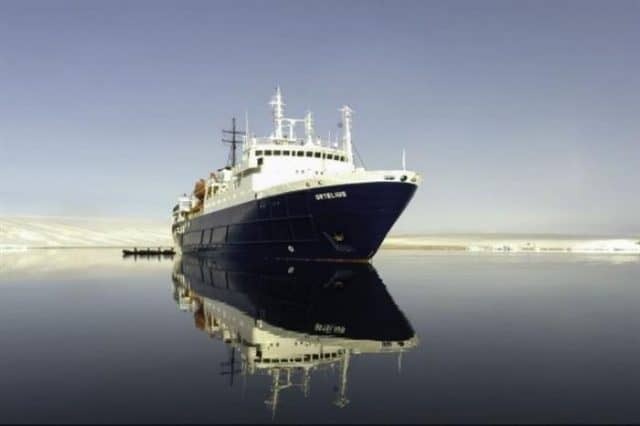 You can compare the ship to it’s Arctic sistership from the Oceanwide Expedition fleet, the Plancius. Indeed, they’re much alike, and both explore the polar regions, with the Plancius sometimes moving to Antarctica as well. The Ortelius offers scuba diving cruises on the Antarctica Peninsula in January, February and March each year. First thing to know, you have to be an experienced cold water diver and be use to dive in a dry suit in order to join such an adventure diving cruise. Diving in Antarctica is shallow, averaging 20 meters / 60 feet in depth, and done 1 or 2 times a day. You get to swim with penguins, seals and sea lions. Plus, you can discover other live creatures such as sea snails, giant isopodes and kelp walls. It sure is an experience suitable only for a few serious and passionate divers in this world. If you have been diving on board this liveaboard dive boat in Antarctica, please share your review and let us know what you thought. Please post your comments in the review section below, by doing so you will help fellow divers to plan their next diving trip . No Liveaboard Review yet on this page, please comment if you have been on the MV Ortelius cruise. The Ortelius is a unique opportunity for either an adventure cruise or a scuba diving cruise in Antarctica.